An unexpected invitation to visit the parish of Partra, by the active Catholic curate, who resided there, was accepted. "You will find him," a Protestant gentleman remarked, "an active, honorable man among the poor, and one who has done much good." The country about him scarcely had a parallel, even in Skibbereen. Eleven miles from Castlebar opened a bright spot of taste—a glebe-house and tidy new chapel, which this indefatigable curate had built, in spite of all poverty. In the chapel were a few half-dead children huddled upon the floor, some around the altar, with their writing-books upon the steps for desks, without table or benches. These the curate had gathered among the starving, for the sake of the black bread, which kept them barely alive. The neighborhood abounds in novelties, strange and romantic, but most of them must be passed over, to leave room for details of the people. This indefatigable man had caused a fever shed to be erected, on a bog bordering upon the Lake of Musk, where pure air is circulating, and a snug cottage stands near, in which the matron who keeps the hospital resides. Thirty invalids were here, mostly sick from the effects of hunger, with swollen legs, many of them past all hope. Far away from any inhabitant, this hospital, cottage, and their inmates stood, struggling to keep up the dying flame of life, only to suffer fresh and hopeless troubles. Solitary as this region everywhere is, it was once celebrated ground. That day's excursion to me was full of strange scenes and strange anecdotes. Here stood the stone raised in memory of the death of John, the "priest killer;" here is the site of an ancient abbey, but twelve feet wide; here, on the borders of the lake, is an anvil belonging to a forge, which is of such weight that it has never been raised from the bed into which it has sunk, and where it is supposed to have lain for centuries. An iron ore-bed is near the spot, as useless as all materials for improvement are in Ireland. This parish borders on the famous Joyce country, and is replete with interest, where in days of yore robbers and murderers sported at will. A noted robber, by the name of Mitchell, was taken in a house pointed out, now in a crumbling state, but then occupied by a landlord who entertained the mountain robber, and had even bargained away his daughter to this desperado. A handsome reward was offered to secure this fearful prowler, and the landlord, in spite of family relation or treaty, determined to make sure the prize. One night, when Mitchell, overcome with a mountain excursion of plunder, had gone to sleep with his pistols near him, the landlord wetted the pans, went out and took in the magistrates to Mitchell's bed, who was still asleep, but soon awaked—seized his pistols—they refused to act. He was secured, bound, and finally executed. On the route this day, among all the rarities, was the christening of an infant in a miserable dark cabin by this priest, which he assured me was the only birth he had known for months. May I never see the like again! The dark mud cabin—the straw on which the mother lay—the haggard countenances of the starving group—the wooden bowl of "holy water"—the plate of salt—the mummery of the priest, while he was putting the salt of grace to its lips, the blowing with his breath to infuse the regenerating spirit into the soul, were such a trifling, fearful combination of nonsense and profanity to my dark mind, that it was quite difficult to keep a usual degree of sobriety, but the priest escaped with no other lecture than an exclamation of nonsense, when we were out of the cabin. To do these poor priests justice, they have labored long and hard since the famine, and have suffered intensely. They have the most trying difficulties to encounter, without the least remuneration. In the best of times, their stipulated sum is but ten pounds a year, the remainder must be made up by "hook and by crook." Weddings and christenings formerly gave what the generosity of guests could bestow, which was always so small, that a Protestant lady once, from pure benevolence, attended one of these cabin-weddings in the poor parts of the country, and put four pounds into the plate as it was passed round. She said the priest was a peaceable citizen, very poor and very kind, and why should she not give this, which she could spare, and he needed. In the famine, night and day, their services were requisite, no fevers nor loathsome dens, nor even caves could exonerate them, they must go whenever called, and this without any remuneration. One day's excursion will better illustrate this fact, than general remarks can. I went to a spot on purpose to see for myself, and that day asked the priest to show me the most that he could of the realities of the famine, and soon I was gratified: the sight was too much, and in a few hours my way was made back in the rain over the fearful waste alone to the glebe-house. We were soon met by applicants of all description begging on their knees, clinging fast to the poor man, begging for God's sake that he would give them letters to the relieving officer for the pound of meal, asking advice how and what to do, when they had pulled down their cabins and had no shelter; the rain was falling, the roads bad, and the multitude so increased as we proceeded that it was very difficult to make our way. He told them, they must let me pass decently as a stranger, who had come out to see them through pity, and kindly added, "You know I would relieve you, but cannot." Not one impatient word ever escaped him through the whole, although their unreasonable importunities were dreadfully tormenting. I had heard so many relieving officers and distributors scold and threaten, and had struggled so hard myself to keep patient without always succeeding, that I inquired how he kept without scolding. His answer was, "Sure, as I can give them no money, I should give them kind words." Here were cabins torn down in heaps, and here were the poor wretched starving women and children, crawling together by the side of ditches, or in some cabin still standing, to get shelter from the rain, scattered too, over a wide extent of country. "What shall I do?" said the despairing priest; "let me die rather than witness daily such scenes as I cannot relieve." I left him to go farther into the mountains, where some of the dying had sent for him, and ascended a little eminence alone, and saw the smoke of the humble abode of the parish priest, by the name of Ward, and all without and within gave proof, that if he had lived for gain, he had missed the road thither. 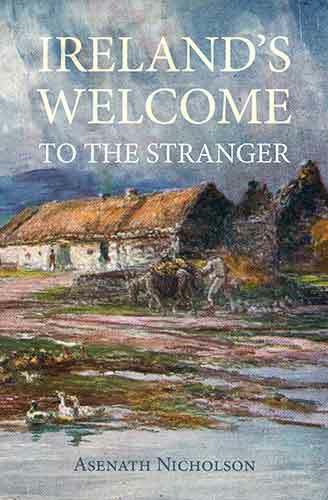 He was a simple-minded priest of the old school of Ireland, and had added no new-fangled notions of modern style, and welcomed me to his house like an old patriarch of four thousand years ago; the poor found in him a friend whose warm heart and open hand always were ready to give, so long as he had anything to bestow. Thirteen hundred of his parishioners had died in Partra of the famine in twelve months, out of a population of six thousand. I returned home with benediction added to blessing upon my head, for having come to visit so poor and so neglected a people as his in those desolate mountains. The curate did not reach home till late in the evening drenched with rain; he had left without shelter a dying man, with his wife and daughter standing by, and giving them the last sixpence, he had returned, for he could do nothing more. At the dawning of day the daughter stood at his window, saying her father was dead, and begged that he would go and do something to assist in putting him away from the dogs!